Since I've read the book The Book Whisperer, I'm constantly asking myself if my student's assignments are helping them become a lifelong reader and/or writer. I'm really trying to create as many authentic assignments that aren't just busy work or things that will be tossed aside. I want their work to mean something. I took those things into account when I created my student's Writing Menu for the Daily 5. I wanted them to be writing but also have it relate to reading. It is our reading block after all! I wanted to keep it simple but also provide choice. I do teach lessons on each of these choices before I just give them to the students. We do them together, all at once during Work on Writing before I allow student's to make their own choices in the Daily 5. It is very important the student's know the expectations before I send them off to do an assignment. A Book Hook is just basically a book commercial. Students persuade other students to read an awesome book they just read. It is just like if you were to recommend a book to a friend, you'd tell them about the story but you don't give away the ending! Thats exactly what I want my students to do. For students to do a Book Hook they have to really comprehend the book. It involves so many critical thinking skills! 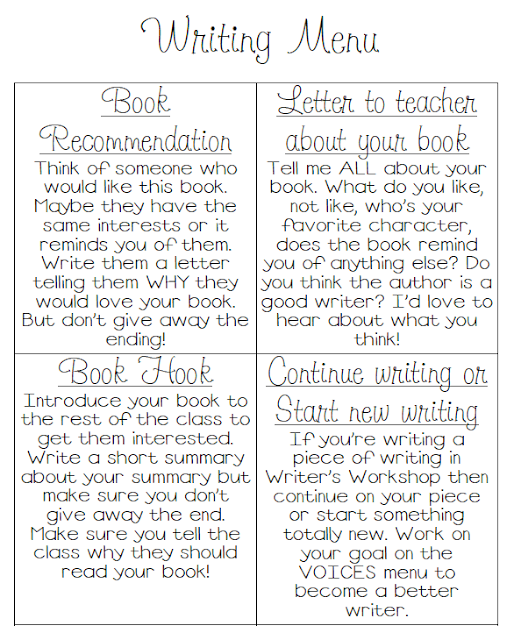 Students must do one Book Hook a month. This is to get students talking about books and get them adding to their 'Books to Read' list in their reading binder. I give several examples of book hooks at the beginning of the year then we write a few together. This way students know exactly what I expect before they begin writing their own. They do present their Book Hooks to the entire class so a portion of their grade comes from presentation. This is the only Daily 5 Writing element that will be for a grade. In order to grade it, I use a Rubric. I love rubrics. It makes things so much easier to grade! I have a calendar by my Daily 5 board that students sign up for their book hook. This way I can see if we have an presentations on a certain day or who still needs to present when the month is nearing an end. Students write a letter to a fellow student recommending them a book. They turn it into me first (so I can read it) then I deliver it to the student. If students are having a difficult time then we can look at my VOICES board and focus on their one writing goal and make that really strong in their book recommendation. 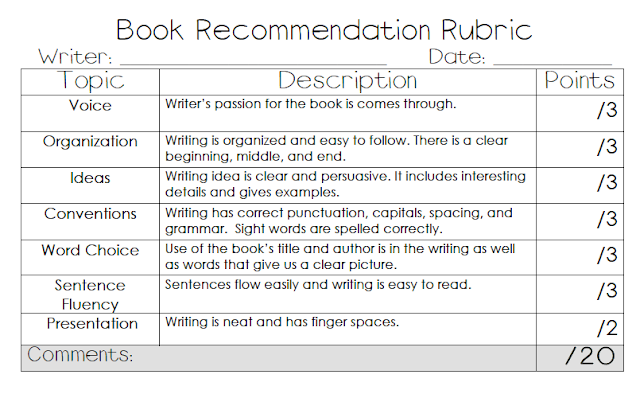 I did create a rubric for the Book Recommendation (seen below) but it isn't for me to fill out. I want the students to fill it out. This way they reflect on their writing and I get to see how they think they are doing. Also it kind of acts as a checklist to make sure they used the book's title, they were persuasive, they used great word choices, etc. This is self explanatory however I do write back! I got this idea form The Book Whisperer and love how she writes back in a reading buddy way, not a teacher way. I think this will help build relationships with the students, model great writing for them, and is another way for us to chat about books in an authentic way. I don't write back every week because well that would be pretty time consuming but every other week is manageable. If students are really into what their writing in Writer's Workshop then who am I to stop them? If they are so inspired or have a great idea they can't wait to write about them, they can. During Writer's Workshop they can write letters, stories, and more; the sky is the limit! If students are short on ideas then they can look at the idea list in their writing notebook but I NEVER EVER give them ideas. I want them to come up with them all on their own. So those are my only 4 choices that require little to no prep work, just a few lessons before students do them on their own. I do have some more ideas (like our class journals) I'll add in to keep Work on Writing interesting but I'll have to pull those out as the school year goes on! What do your students write about during Work on Writing? Have you made a great visual that has the pictures of a card, story, letter, list, etc? I made one on a trifold board for my first graders last year and it went well but I found they only made the same 2 or 3 things anyway. I wanted to up the expectations for my second graders this year! I am a second grade teacher. I was first last year but so excited to move up to second! This year will be my second year! I actually started this blog last July I believe but I didn't update it regularly through out my first year teaching but I made a comeback at the beginning of the summer! I love your rubrics! I live by rubrics, I think it communicates expectations and outcomes effectively and efficiently. I came here from the blog hop. I am your newest follower. 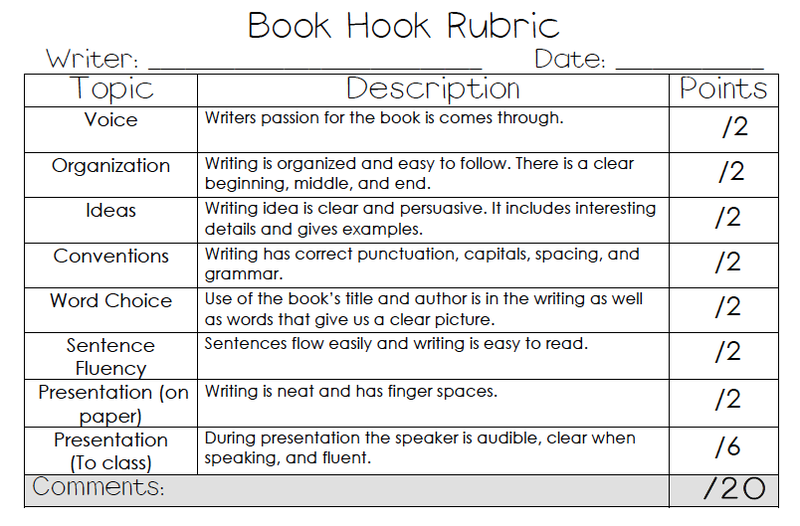 I love your rubric and ideas for Daily 5 Writing part. Struggling for authentic, meaningful work in centers is something I think we all deal with. I don't want it to just be busy work, I don't want a thousand papers to grade, I want them to truly practice and learn something that they can use for life. Your writing menu looks great! I love menus. I am your newest follower! Thanks for coming by to check out my blog! I love it when I find other second grade blogs!! Here's a happy hello to blogging. I teach 3rd, stop on by. Hi! I found you through the blog hop. I really like the Writing Menu. I am going back to first this year, and I really want to get them excited about writing. How do you help them make a list of things to write about? I'm guessing that you have them reflect on themselves. Also, do you have them Work on Writing, mostly in a notebook? That's how I have done it. But this year I want to set up a center too, that would have fun stationary for writing letters, lists, and such. Making lists is a writing lesson I do at the beginning of the year, I will post on them making lists in the future so stay tuned! I am so happy that I stumbled across your blog through the linky party! Hello fellow Floridian! 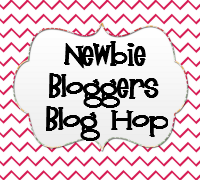 I'm following you now via the blog hop! Ok, I just found your blog, and I am kind of obsessed with your blog degign! I also love the idea of your "Book Hook!" Hi Amber! I am catching up on some of your posts :) I just finished rereading The Book Whisperer today, so it was perfect timing to read this post! Thank you for all of the great rubrics and ideas! 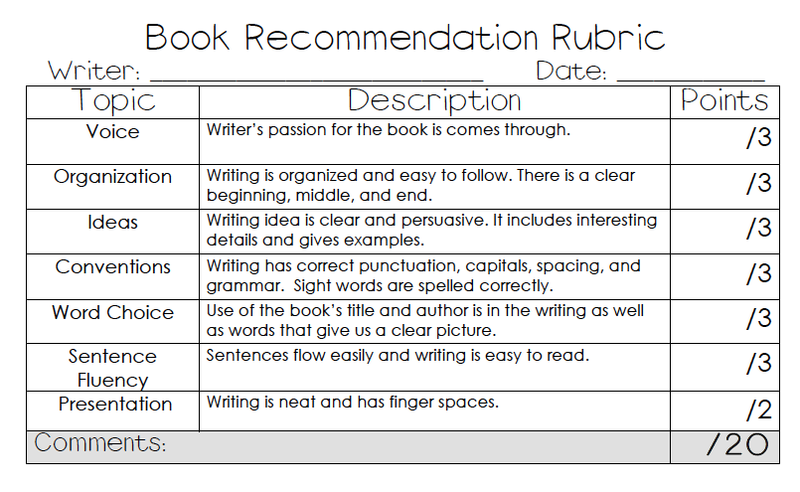 Thanks for sharing the great writing menu & rubrics. In your writing menu you refer to a Voices Menu...can you post a picture of what your voices menu looks like? From this blog i learn how to write best paragraph. I need someone who can summarize an article for me this would be great help. I am very very impressed by this and I hope that you will soon provide some more amazing articles.